Air China has just launched amazing flight offers to visit Bangkok and Thailand for a fraction of the original price for departures in November 2017, dont miss the opportunity to visit one of the most exciting cities in Asia e discover the many treasures that the nation has to offer. Not sure how to plan your journey in Thailand? 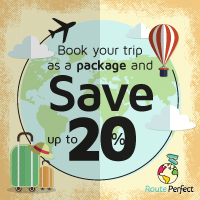 Visit our partners Routeperfect to plan your perfect getaway and receive up to 20 % discount on hotel accomodation.